Tom Kolb Modes for Guitar PDF + Mp3 CD download. In this one-on-one lesson, MI instructor Tom Kolb unravels the mystery of the modes, giving guitarists a complete approach to soloing and a thorough, hands-on explanation of Ionian, Dorian, Phrygian, Lydian, Mixolydian, Aeolian and Locrian. He also covers: melodic minor, harmonic minor and the blues scale; soloing over diatonic and modal progressions; superimposing modes; patterns, progressions, licks; and much more. The accompanying CD includes 83 full-band tracks. Tom Kolb presents very clear explanations of what modes are, and how they are used in everyday music. The accompanying CD is great, with riffs & licks to give you an idea of how to use each mode, along with a full backing track to jam to. The CD alone is worth the purchase price. This is not a book for a complete beginner. At minimum, you should be able to play the major scale all across the fretboard in any given key. It would help if you were already familiar with the 5 patterns of the major scale, (or the 7, “Three Note Per String” patterns) before tackling modes with this book. This is simply because if you are already able to play the major scale all across the fretboard, then the book will show you how to now incorporate modes into your playing and you can use those patterns to do so. Check out the Guitar Fretboard Workbook if you’re not familiar with major scale patterns. When you’re ready for modes, get this book. Make sure you have a good setup for being able to play the CD. Learning modes is less about knowing patterns and much more about using your ear to hear the modes over chords, so its critical that you have some sort of backing track available. 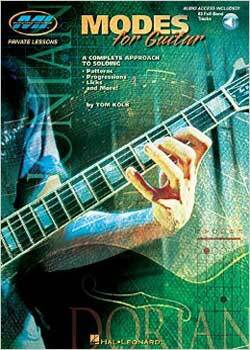 Download Tom Kolb – Modes for Guitar PDF free and other books from our site. Only high quality PDF scans. Please write a review, it's important for our community. Thank you very much for music knowledge.